In 1906 plans were filed with the New York City Dept. of Buildings for a $50,000, 5-story brick and stone garage at 137-139 West 89th St. The owner was Wm. C. Strange, Jr., 112 Riverside Drive, and the architect was L. A. Goldstone, 110 W. 34th St. The garage opened that year. However, it was not called the Monterey Garage. Rather, it was called the Acton Garage. 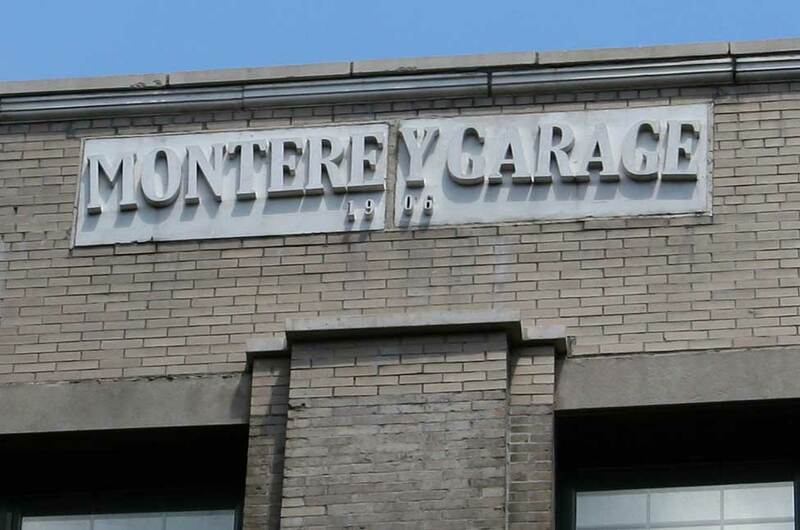 The name, Monterey Garage, did not appear until more than ten years later, approximately 1919. Incorporation of the Acton Garage Co. was reported in Motor World, vol. 14, no. 2, 11 Oct. 1906: "New York City, N. Y. - Acton Garage Co., under New York laws, with $10,000 capital: to conduct garage. Corporators - W. C. Strange, W. C. Strange Jr. and R. G. Strange, all of New York City." The Acton was described as follows in the 1909 Motor Cyclopedia Year Book, "Acton Garage, Inc. - 137-39 W. 89th St., New York City. (Westinghouse.) Cap. $10,000. Est. 1905. William C. Strange, Pres. ; William C. Strange , Jr., Vice-President; Robert G. Strange, Sec'y and Treas. Garage, 125 cars. Repairing and supplies." In 1912 The Register of Factories, New York State Dept. of Labor, listed the Acton as an auto repair shop, employing 36 men. The top of 137 W. 89th St. was severly altered at some point. The original cornice and all of Architect L. A. Goldstone's Beaux Arts decorative elements at the top were stripped away. Possibly this was in 1924 when an alteration permit was filed with the Buildings Dept. 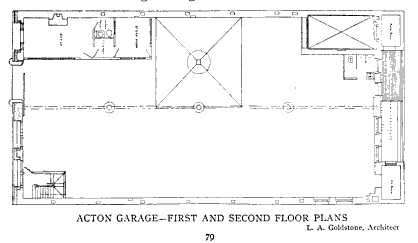 Compare with this view of the Acton Garage in 1911. The original owners of the Acton Garage were William Crawford Strange (1855-1936) and his two sons, Robert George Strange (1881-1952) and William Crawford Strange, Jr. (1883-1945). William C. Strange was a real estate broker and developer in New York in the early 1900s. In 1910 Robert G. Strange lived at 203 W. 94th St., Manhattan, with his wife, Florence Strange, a concert singer. In January, 1921, now an actor, he married Diantha Pattison, also an actor, in Cleveland, Ohio. In 1940 he was a free lance actor in motion pictures living in Los Angeles, Calif., with his wife, Ruth. (Third wife?) The Internet Movie Data Base has the following on Robert G. Strange: "Robert Strange was born on November 26, 1881 in New York City, New York, USA. He was an actor, known for High Sierra (1941), The Story of Vernon and Irene Castle (1939) and King of the Royal Mounted (1940). He died on February 22, 1952 in Hollywood, California, USA." Find-A-Grave.com has a Strange grave site at Fairhaven Memorial Park, Santa Ana, Calif. Stones are shown for William C. Strange, Jr. as well as Father: William C. Strange 1855-1936 and Mother: Mary Y. Strange 1859-1940. After the Stranges, ownership of the Acton Garage came to Robert Thedford (1881-late 1920s). Robert Thedford was a member of the Thedford family who were coal and wood dealers in New York going back to the 1870s. Originally this was George William Thedford (1849-1914), an immigrant from Ireland in the 1860s. Robert Thedford was the son of Thomas Thedford, also an immigrant from Ireland, born 1841. The 1900 U.S. Census says he immigrated in 1857. He may have been George W. Thedford's older brother, but the family connection is not clear. Robert Thedford, Automobiles is listed in the 1913 New York City telephone directory at 137 W. 89th St., as is Robert Thedford Garage Co. Inc. In 1916 the New York Times reported, "The Robert Thedford Garage Company, Robert Thedford President, has leased from the Paterno Construction Company the new six-story fireproof garage at 219 and 221 East Sixty-seventh Street, for a term of twenty-one years at an aggregate rental of about $300,000. Thedford & Co. were the brokers." An ad for the Robert Thedford garages on 67th St. and 89th St., appeared in the Times, 22 Oct. 1916. In 1918 Robert Thedford, age 37, born 30 Aug. 1881, registered for the World War I draft when he was "President, Acton Garage Corp., 137 W. 89th St., New York, N.Y."
Another early owner after the Acton became the Monterey Garage was Isidor M. Stutz (1868-1923), an immigrant from Russia. He appeared in Polk's 1922-23 New York City Directory as owner of the Monterey Garage. Stutz's entry in the 1920 U. S. Census recorded his occupation as "Clerk, Ebel." Ebel refers to Fred Ebel & Co., dry goods, at 831 10th Ave. Stutz seems to have been a partner there with Frederick Ebel (1887-1971). Later, Polk's 1925 city directory identified Frederick Ebel as owner of the Monterey Garage. Ebel's association with the Monterey Garage spanned the years 1923 until the 1940s. He registered for the World War II draft in 1942, age 54, employed "Baldwin-Monterey Garage (own business) 137 West 89th St., Manhattan." Another owner at the Monterey Garage was Ernest E. Hirschbein (1887-1967), an immigrant from Bohemia. His wife was Esther Stutz (1897-1999), a daughter of Isidor Stutz. She was Essie Stutz, age 3, living with Isidor Stutz on Kingsbridge Road, the Bronx, in 1900. Hirschbein was connected with the garage from approximately 1924 to 1933, when he would have been Fred Ebel's partner. Frederick Ebel's partner at the Monterey Garage from appoximately 1936 to 1944 was Harry Paul Baldwin (1891-1944). Harry Baldwin registered for the World War II draft in 1942, age 50, employed "Self 137 W. 89 St N.Y.C. NY." Hilary Grossman in Manhattan Parking Garages 1897-1930 (available on the internet at academiccommons.columbia.edu) gives the following on the later history of the Monterey Garage, "The building remained the Acton Garage until 1950, when it changed ownership and became the Monterey Garage. It came under threat in 1962, when it was seized by the City of New York as part of the Upper West Side Urban Renewal Plan. The Plan expired in 2002 when the building was put up for sale by the City. Kenny Mance, whose family ran the garage from the 1950s until it was seized in 1962, got control of the garage once again in 2002." 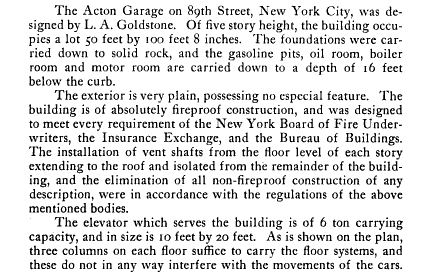 The architect of 137 W. 89th St. was Lafayette A. Goldstone. The following on his career is quoted from http://prewarpassion.net "Lafayette A. Goldstone was born in Poughkeepsie, in upstate New York in 1876, and died in 1956. Like many architects of the period, he never received a formal architectural education, but learned by apprenticing with other established architects, starting with drawing lessons from architect William Henry Cusack as a boy. He came to New York City at the age of fifteen and worked briefly as an apprentice draftsman for Bates & Barlow. Next he joined Cleverdon & Putzel, where he remained for the next six years, ultimately rising to the position of principal draftsman. After serving in the Spanish-American War, Goldstone worked for a real estate developer and builder, primarily supervising the construction of tenements designed by George F. Pelham on the Lower East Side. Following this, he took a position with Norcross Brothers, a construction company known for its high-quality work. In 1902, when Goldstone accepted a commission from James Carlew, a former client of Cleverdon & Putzel, to design and supervise the construction of three houses on the Upper West Side, he decided to leave Norcross Brothers and open his own office. Through 1908, Goldstone designed a wide variety of buildings, including an additional apartment house on Riverside Drive, stables, a loft building, two country houses, a distillery, and one of the city�s earliest purpose-built garages, the Acton (now Monterey) Garage (1906) at 137 West 89th Street."